A six sided hexagon in honor of the element carbon, this lab created diamond bracelet features 7 total conflict-free lab diamonds at 0.21ctw. Available in 14kt yellow, white, or rose gold. Arrives on a 6.5" chain with additional loops. The perfect gift to celebrate any occasion. Free shipping and 30 day returns. 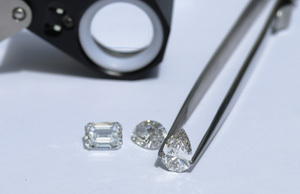 Learn about lab diamond pricing, the 4c’s and more. Ada Diamonds Design Description- This geometric, modern lab created diamond bracelet features 7 total conflict-free lab diamonds at 0.21ctw. Available in 14kt yellow, white, or rose gold. Arrives on a 6.5" chain with additional loops. The perfect gift to celebrate any occasion.